Designed by Ida C. Farr in 1921 as a scarf end, this pattern features an overﬂowing basket of fruits, and she named it after Pomona, the goddess of garden and orchard. You can crochet this lace for the ends of a table runner or tablecloth, or for a beautiful lace curtain. With six variations on a gorgeous chrysanthemum—scarf end, tablecloth corner, napkin corner, wide border (with corner turn), square, and insertion—you can accessorize any room in your house. Bring a touch of the tropics to your home decor with palm trees, ﬂowering vines, and a basket full of tropical ﬂowers. 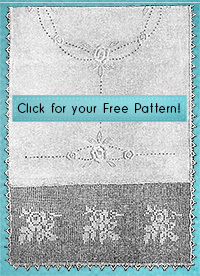 Originally designed in 1920 by Mary E. Fitch, the pattern is ideal to use for a valance by sewing plastic rings to the top.